"What Is It?" asks Honda's advertising brochure. Just a revolutionary off-road vehicle destined to launch a whole new industry that will sell more than 6.5 million machines*. Glen Helen Raceway will host the 1st round of the ITP ATVA Grand Nationals Round #1 presented by Weekend Warrior on February 5-6, 2005. Maxxis Sponsors the WORCS ATV World Off Road Championship Series. Maxxis announced that it will once again be the official motorcycle and ATV tire of the World Off Road Championship Series. For many years now, the most popular cars sold in America haven't been cars: Pickup trucks staunchly remain the perennial best sellers. How can that be? Pickup trucks continue to enjoy spectacular popularity across a wide spectrum of the driving public because of the versatility they provide. It seems as though people in this country constantly transport items large and small, to and fro, whether for work or play, and the versatility of a light-duty transporter shines through. The same can be said of one of the hardest working tools in the great American toolbox: The ATV. Kawasaki Motors Corp., U.S.A. announced the launch of the new Kawasaki owners club, effective immediately, which replaces the Good Times™ Owners Club (GTOC) and enhances member benefits to make Kawasaki motorcycle ownership even more enjoyable. The ATVA has announced that a 102-decibel sound limit will be enforced on Pro racing machines during the 2005 Motocross Grand National Championship series. 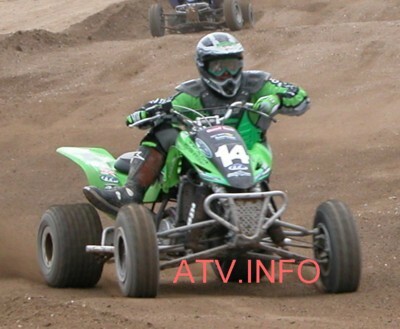 2004 ITP Quad Cross ATV Champion is headed to the GNC MX Tour. Jeremy has been racing the ITP Quad Cross and Big Six Grand Prix’s here in southern California the last couple of years with great success. I do not know if they are the first but MudGalore puts a new twist on ATV clubs. MudGalore is a woman's atv club! MudGalore has been founded with the mission to recruit and support women in the world of atvs.